5. (1) Retired public officers who have held offices to which this paragraph applies are prohibited from service or employment in foreign companies or foreign enterprises. 6. (1) A public officer shall not ask for or accept property or benefits of any kind for himself or any other person on account of anything done or omitted to be done by him in the discharge of his duties. (3) A public officer shall only accept personal gifts or benefits from relatives or personal friends to such extent and on such occasions as are recognised by custom: Provided that any gift or donation to a public officer on any public or ceremonial occasion shall be treated as a gift to the appropriate institution represented by the public officer, and accordingly, the mere acceptance or receipt of any such gift shall not be treated as a contravention of this provision. (b) any benefit of whatever nature from any company, contractor, or businessman, or the nominee or agent of such person: Provided that the head of a public corporation or of a university or other parastatal organisation may, subject to the rules and regulations of the body, accept a loan from such body. 8. No persons shall offer a public officer any property, gift or benefit of any kind as an inducement or bribe for the granting of any favour or the discharge in his favour of the public officer’s duties. 10. A public officer shall not be a member of, belong to, or take part in any society the membership of which is incompatible with the functions or dignity of his office. (b) at the end of his term of office, submit to the Code of Conduct Bureau a written declaration of all his properties, assets, and liabilities and those of his unmarried children under the age of eighteen years. (2) Any statement in such declaration that is found to be false by any authority or person authorised in that behalf to verify it shall be deemed to be a breach of this Code. (3) Any property or assets acquired by a public officer after any declaration required under this Constitution and which is not fairly attributable to income, gift, or loan approved by this Code shall be deemed to have been acquired in breach of this Code unless the contrary is proved. 12. Any allegation that a public officer has committed a breach of or has not complied with the provisions of this Code shall be made to the Code of Conduct Bureau. 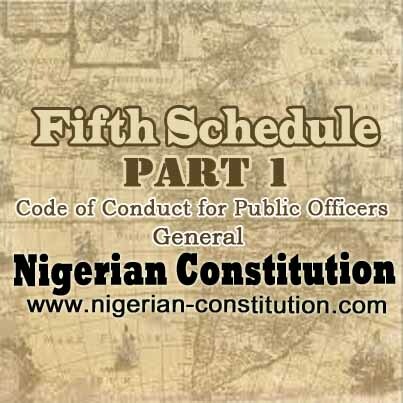 (b) the National Assembly may by law exempt any cadre of public officers from the provisions of paragraphs 4 and 11 of this Code if it appears to it that their position in the public service is below the rank which it considers appropriate for the application of those provisions.